[The] wonderful world of mecha. Ever since the early days of Robotech, have I been interested in this interesting genre, then the real eye opener came when I witnessed the masterpiece that is Gundam 0080, War in the Pocket... aah, enough nostalgia. Let's begin! The bigger it is, the faster it, is. The more extra gadgets it has, the more advanced it must be. This also means, the bigger the gun, the more powerful it is! The speed is directly proportional to the amount of thrust you see. [One] of the reasons why anime mechs look so damn cool stem from two main points... (or that's my theory). 1. They are based of pseudo-science. - i.e. They are believably unbelievable. 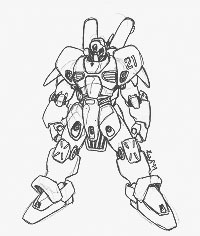 For example, in the American mecha show "Exo Squad" (mercy on those who have seen it) - one of the mechs featured is an inferior copy of the "Destroid Phalanx" from Macross, aka the Spartan Destroid from Robotech. The Phalanx was believable, because of a few reasons. It was big and unwieldy due to inferior technology. It had inovative missile launcher arms. The large ports on the back of its arms were to vent missile exhaust. It was powered by a thermonuclear reactor. Thus, with a bit of science applied, and some common sense, a great mech was developed. Now consider the "Exo Squad" copy. Not being a fan of the show, I don't have a picture handy... but the gist of it was, it was simmilarly shaped, but was a power armour rather than 50 feet tall. It shot out 3 foot long missiles from a 12 inch long missile launcher that could flip up... to reveal grappling hooks... o_O;;; what's wrong with this picture??? Also, there's no room for the engine, unless the pilot powers his mecha himself with a treadmill or something... Oh, and did I mention that it's lime green? (actually, that's a style issue, but it's bad none the less) This is a case of bad common sense and poor design. Clearly, you see the difference the application of pseudo-science makes. 2. Surperior asthetics - Stlying. 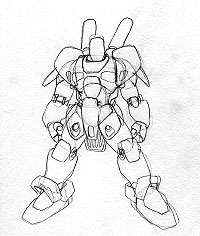 - Japanese mecha have a distinctive stlye. When compared to well designed American mechs, say from Battletech, the squarish, uninteresting (although well thought up) designs must take second prize to the dynamic looks of Japanese robots. [Basically], your fuel expenditures would be horrendous. Especially how they expend fuel in anime. ~ Not to mention you have extremely combustible fuel tanks hanging off the back 'o your mech... nothing like operating a flying bomb. (see the laws.) In the Macross universe, they get around this problem by equipping all vehicles (ie. Valkarie Fighters and Destroids) with thermonuclear reactors. Gundam universe Mobile Suits are equipped with Fussion Reactors (at least in the UC timeline, god knows what they are powered by in Gundam Wing and G-Gundam). They can also be powered by a variety of other non standard sources... In Giant Robo, all robos are powered by the mysterious "Shizuma Drive". Hell, in Tekkaman Blade, the main character uses some sort of gem to power his armour. 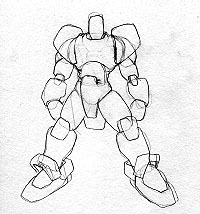 [To] design the "generic mech", sketch the rough outline of your mecha. Normally, mechs are humanoid in shape. 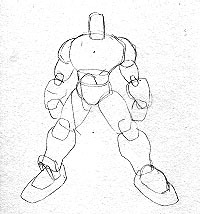 So just produce a wireframe approximating the shape of your mech, using basic geometrical components. [Here] comes the fun part! Now add, detail such as fuel pods, thruster ports, detail the hands, extra armour plates, intake valves, etc. etc. etc. There will be a seperate section on doo-dads later on in this section. [Now] darken your final lines, add final detail to your "details" from step 3. You may add more detail at any level you wish, but I usually leave it towards the end. Add, texturing to the connecting tubes, flanges to the intake valves, detail the head, the body etc. etc. etc. [The] following are a sample of items you can add to any mech to make it more "interesting". If there are any others you are interested in seeing here, let me know. Rotor assembly, basically a combination of hydraulic jacks, cables, rotors, electric motors - used in joints. Of course you could always cover these with armour because it would make more sense, but hey, they look cool! Cabling: Left: standard ribbed cabling, like you might see in electrical wiring, the metal encased kind. right: cloth or wire covered cabling, for added flexible protection. I personally like the latter, but use both. Its your choice. Manuever jet assembly: ah, you see these lil' round things on Gundam kits. Well they're apogee motors, or manuevering ports. Here is a cut away so you have a better idea of how they work, rather than adding little circles.